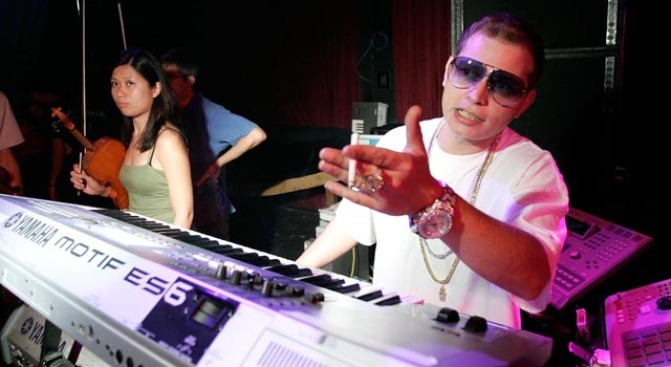 Producer Scott Storch is getting back to his musical roots in Miami after a long ride on the bad boy/bad decision train. And from the "Where Are They Now" files: Scott Storch. After a nasty smack at rock bottom estates, Storch is trying to find residence in the land of hope once again. The Grammy-winning producer behind acts like Beyoncé, Dr. Dre and Snoop Dogg, 50 Cent, Fat Joe, Lil Wayne and Paris Hilton (that last one must have been during his drug haze), fell out of fame’s limelight when he traded in beats for booze, coke and $30 million dollars worth of debt. Three years of drug abuse led Storch down a path of “poor judgment decisions,” he tells mtv.com. Those decisions included forgetting to pay child support and property taxes and getting arrested earlier this month for grand theft auto after allegedly neglecting to return a Bentley he leased a few years back. How do you forget to return a car you leased? It's not hard when your mind is chocked full of Peruvian marching powder. Storch is on the road—sans Bentley—to clean living these days. After calling it a wrap on rehab, he’s on to music making in, of all places, Miami. Known as a den of sin, some may wonder if Miami is the best place for a former addict to try and start over. But Storch doesn’t see the city that way. He sees Miami’s Hit Factory as the place where he made his mark and the place where he hopes to make it again. "I'm taking it back to square one," he tells MTV. "I found myself slipping a little bit. I got involved in doing drugs. I had to get myself into recovery. Being in the life that I was living—very fast-moving, option to do anything you want, go anywhere you wanna go—it definitely takes its toll on you, and you lose your concept of reality. I had to get it under control. I had to take it back to the beginning and back to the Hit Factory, where I made a lot of my hits." Let’s just hope he gets back to making hits instead of taking them.